Weston A Price writes to his nieces and nephews (quoted in Nourishing Traditions, paraphrased here) that when possible, folks should save spring butter (from cows on fast-growing green grass in May and June) to eat in the winter to benefit from the high Vitamin A and D content. I’ve taken this to heart and have a couple pounds of spring butter in my freezer, waiting for the frosty Michigan winter. Need to learn more about culturing dairy? Try GNOWFGLINS Fundamentals, a multimedia course with videos, text files, and teacher interaction to help you through the new frontier of traditional foods. The best thing I can think of to compare the consistency to is Marshmallow Crème, but if you’re a real foodie you’ve probably never seen that abomination! Homemade sour cream: In the winter, if your house is 65 degrees or below, as you whip the crème fraiche you can stop at the “whipped cream” phase with cultured cream, and your crème fraiche has just the consistency and taste of sour cream. Seriously yummy! Be careful though – mine still only lasted just over a week in the fridge before going completely nasty. Not as obvious a demarcation between butter and buttermilk as in the previous post. There's the butter on the spoon. It is so soft it almost acts like whipped cream, so be careful. It’s still butter! I didn’t think my butter had separated at first and even gave up and packaged it all as “sour cream”. 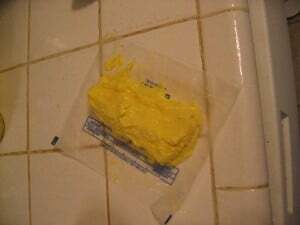 It hardened in the fridge, though, so I deemed it butter. 🙂 If you want the sour cream phase, use colder cream, but the process as a whole will take longer. UPDATE: My friend claims that the longer you leave the blender running, the better it separates! She hasn’t done it with cultured buttermilk, but I think she’s onto something because my last batch was easier to separate, and I got distracted and left it running longer than usual. My apologies to those of you who believed me when I said you could overmix and the butter would churn back into the buttermilk! You need to use gentle hands to squeeze the buttermilk out and really cold water to rinse. Especially with the thickness of cultured buttermilk I would only use my hands here. (Although I just read Food Renegade’s blender method of rinsing, and I’m intrigued. That sounds like a lot less work!) Anything else would take too long! Just scrape out the strainer with your fingers. The butter seems almost like sour cream at this point, but it will still solidify nicely in the fridge. Added bonus: the butter is really easy to measure in ½ cup portions! 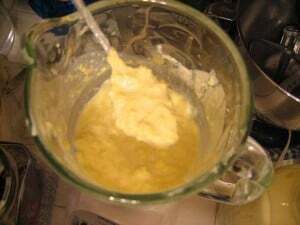 Leftover buttermilk: When using cultured cream, the buttermilk is much thicker and whiter, more like a flour and water mixture. This makes a difference when you’re pouring through the strainer, (especially in warm weather, see above) because it tends to get clogged up easier. I found I could separate the butter by pouring a little bit of the mixture at a time into my strainer, then stirring it (like I meant it!) with a spoon. 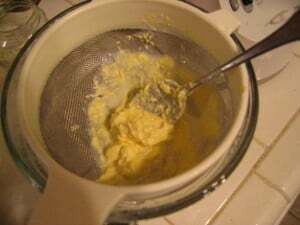 This will force the buttermilk through the holes and let the butter stay in the strainer. I also double strained it, pouring the buttermilk back through my strainer one last time after I got most of the butter out. This got me an extra teaspoon or two; it’s up to you if that’s worth the work. How to use buttermilk: You should be able to use the cultured buttermilk leftover from this butter making to culture your next batch of cream. 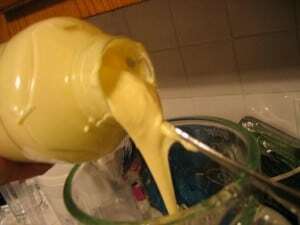 You can use buttermilk from butter in recipes calling for “buttermilk”, but realize that this byproduct of butter making will be extremely low in fat, whereas most “buttermilk” recipes are assuming whole fats. 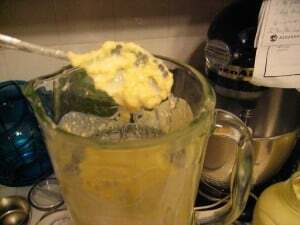 I have used the buttermilk byproduct for biscuits and pancakes, as well as for dipping chicken pieces for chicken nuggets, in place of the egg. You’ll have a lot of it! I would recommend freezing the buttermilk in one-cup portions or so, because it goes terribly sour (musty, almost) in about a week. A fun discovery: I am used to getting 1/3 cup of butter and 2/3 cups of buttermilk from each cup of cream, but with May/June cultured cream, I got more of a one-to-one ratio! I don’t know if that’s the result of better cream (fresh spring grass), or because my cultured cream had totally separated (again) into cream and milk, and the top half was 100% cream. I must usually get some milk mixed in when I skim, increasing the amount of buttermilk left over. I found one more trick to get the buttermilk squeezed out of the butter, especially when it’s so soft you can’t really squeeze with your hands: Roll a ½ cup in waxed paper for storage, and gently squeeze at the point, tilting the open end of the waxed paper roll toward the sink and shaking the buttermilk out. 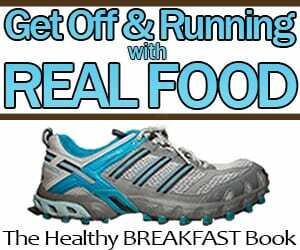 I’m always pleased to participate in Fight Back Fridays at Food Renegade. LOL! 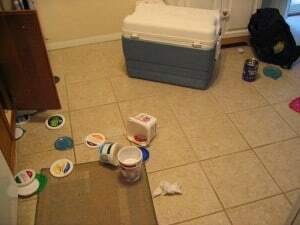 That is EXACTLY what my kitchen looks like some days from my 1 1/2 year old. I’ve deemed it ok for him to play in the lid drawer, but he thinks he should be able to play in every cabinet and drawer. I’m impressed with your butter making! I get raw milk, but I want my son to drink full cream. When I have an extra gallon, I steal the cream for my coffee. 🙂 I’m going to try making mozzarella with the leftover skimmed milk in my freezer. Instead, I increased the butter budget to buy extra raw butter from my farmer right now, to stash in the freezer for winter. It’s so yellow and good, and I have 5 pounds so far. YAY for spring/summer butter! Thanks for sharing this in today’s Fight Back Fridays carnival. Fabulous method, Kristen. I use that kind of container to serve my milk b/c the glass jars are so tough to pour from, but I never thought about skimming the cream that way. I just dip it out with a ladle; since we’re drinking the milk, I want to leave at least 1/3 of the cream in there for us. I’d like to know how you skim cream from milk too! I was just thinking that this morning! I bet it would, as long as you allowed the cream to separate. It’s also not that hard to skim it with a ladle, especially if you’re not trying to get ALL the milk. You can make butter with some milk in your cream, you’ll just get more buttermilk byproduct. The gravy separator should do the trick though! I also use a turkey baster, works great for getting just what I need, and leaving some cream in the milk! See, this just sounds way too complicated. Sigh… But I’m terribly impressed that you’ve got it all figured out! I separate the cream by letting the gallon settle until you see the cream on top then have milk and cream container ready, wipe the bottom of the gal. with basic g. (Shaklee Germicide all natural) then stab the gal. with a knife at the bottom and drain the milk first then pour the cream left from the top quickly into the other container. I find it easier to use the Cuisinart as it is easier to work with… clean… get all of the butter out… also easy to “wash” butter multiple tomes till you get nothing but clear water out. I see folks trying to avoid making a big mess with mixers.. I guess you use what you have.. Only this is that you have to be careful how much cream you add as not to have it flow over at the point where the blade attaches.